Furniture and fittings in your home may keep changing with time but your floor covering is something that will remain for a long period of time. Therefore you need to make the right choice. Choosing new flooring for your home is never an easy process. With so many types of flooring available in the market, i.e. stone, wooden, tiles, PVC or Vinyl, etc. it is easy to get confused when deciding the best type of flooring solution for your home. Among them, PVC flooring is popular flooring type nowadays because of its cost-effective nature and sleek appearance. PVC flooring is popularly known as vinyl flooring. It is more suitable for the cold climate. Vinyl flooring is composed of polyvinyl chloride (PVC), and are made in layers. It is available as tiles, planks, or sheets form. PVC or vinyl flooring comes in many different patterns and styles such as wood, carpet, etc. Also Read: Laminate Wood Flooring: All You Need to Know! It is suitable for low traffic areas. Vinyl flooring is a perfect choice for areas that are prone to spills and moisture such as kitchens, bathrooms, laundry rooms, etc. PVC flooring is durable as it is easy to clean and maintain. It has resistant to water and moisture as compared to other types of flooring. However, with the heavy loads, it can be damaged by sharp and heavy objects. Vinyl tiles are mostly square and can offer the look of real stone or ceramic floors. If there is any sort of damage during use, one can simply even remove the tiles and replace it with a new one. So when you buy, always keep some in stock for such future needs. Vinyl sheet flooring is made up of large rolls without using much labour to cut the material, due to this, there is not much of wastage. It is usually laid without having grooves, unlike tiles. Vinyl planks flooring comes in long, narrow strips. It is easy to install and give you the look of hardwood. Vinyl flooring installation is easy as compared to other types of flooring. It can be installed over concrete, hardwood or plywood. The great thing about PVC or vinyl tiles is their ease of installation. Vinyl tiles are also easy to replace if you decide to remove them in the future. However, it requires accurate measurement for installation. However, the repairing of dents or damages is difficult to repair. It is preferred when it is not possible to get additional thickness to cut doors. Also Read: 7 Kid Friendly Flooring Options: A Guide for Parents! Vinyl sheet flooring is resistant to water and moisture as compared to any other types of flooring. Basically, there are no joints that allow water to seep in and damage the sub-floor. PVC flooring is stain resistant. Any spillages like oil, grease, acids, etc. are easy to clean with damp cloth. Vinyl flooring is light weight as compared to other types of flooring and hence it is easy to install. It requires very little maintenance. You just need to sweep regularly and use a damp mop to keep your floors sparkling. Colours can fade with exposure to too much direct sunlight and floors can also get damaged by extreme temperatures. Improper preparation of the subfloor leads to uneven installation of vinyl flooring. This allows moisture to penetrate causing it to lift and warp. 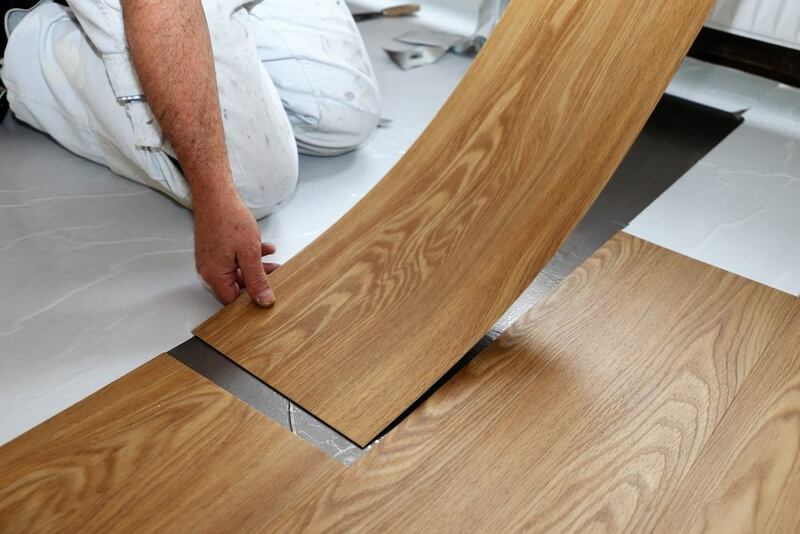 Due to shiny appearance, any damage to PVC flooring will get easily reflected. Therefore a perfectly levelled, smooth subfloor is a must for installation of vinyl flooring. Vinyl flooring is soft, and hence it is prone to dents and scratches which often leave a bad impact on the surface of the vinyl floor. Please, however, note that vinyl flooring has a limited life, say 10 to 15 years. Vinyl flooring emits high Volatile Organic Compound (VOC) which is harmful for human health. Also Read: What are the Advantages and Disadvantages of Mud Flooring over PVC Flooring? Vinyl Sheet Flooring: The standard width of vinyl flooring sheets or rolls in continuous lengths shall be 1000 mm to 2000 mm. Vinyl Tiles: The tiles shall be 250 mm, 300 mm, 600 mm and 900 mm square. The major advantage of vinyl flooring is that they are inexpensive than other type of flooring. Flooring is a big part of your home so be sure to take time and consider what you need from your floor and how PVC flooring or vinyl flooring can meet these requirements. Wood Flooring Types You Need to Know!